Ah, the early days of modding NBA Live on PC! When I went back and made my Definitive Updates for NBA Live 95 and NBA Live 96, the experience was just as nostalgic as dusting off the games to play them. As I mentioned in a Wayback Wednesday feature though, editing NBA Live 95 in particular was fiddly, even with the amazing tools that Tim, Lutz, and Brien developed. Without them, it would’ve been an absolute nightmare, and arguably close to impossible for novices to accomplish. Fortunately, we did have those tools, and they were a driving force in establishing both the NLSC and the modding community we have today. I know that I’ve recounted the tale before, but I was amazed when I discovered the NLSC back in 1997, and the tools that our three founders had made. Suddenly, I was able to do so many things that I’d dreamed of doing since getting into NBA Live on PC. Roster editors allowed created players to be assigned full bio data, and original players to be modified. The minimum and maximum height and weight values could be bypassed. 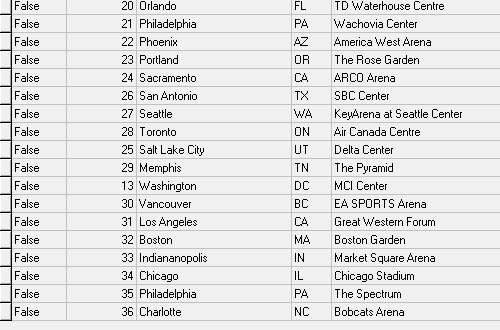 Current rosters, NCAA rosters, concept rosters…we could modify the games in all sorts of ways. Simply put, those tools made modding happen, and surely contributed to the popularity of PC basketball gaming early on. While the tools that Tim, Lutz, and Brien made opened up a world of modding possibilities, the first three games in the NBA Live series could still be a little cumbersome to tinker with. Although NBA Live 97 added the ability to save and load separate roster files, data for all the original players was still stored in the game’s executable. This didn’t stop the development of retro season or foreign league patches, but there were limitations and inconveniences. 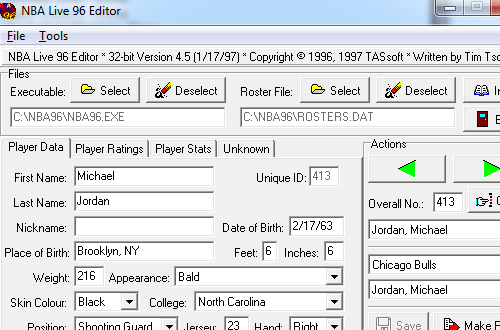 This changed in NBA Live 98 PC as the roster data was now stored in DBF files, which could be edited with spreadsheet and database software such as Microsoft Excel and DB Commander. Player data, team names, pointers to art files…pretty much everything we wanted or needed to change in terms of roster data was accessible. 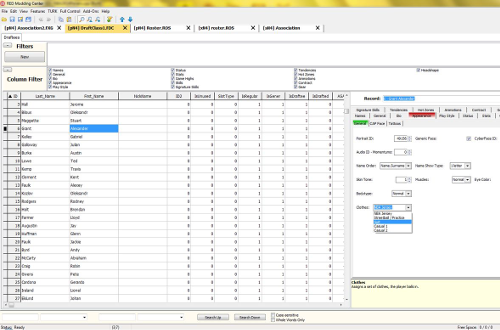 The process was made easier by the development of the NBA Live Toolkits, which were Microsoft Access modules that allowed the databases to be edited in a GUI environment with full explanations of all the fields and values. It was also possible to make those changes to the database directly if you knew what you were doing, so even though specific roster editing tools were handy, they were no longer essential for modding. Specialised tools or not, DBF files made roster modding easier than before, and the results were fantastic. 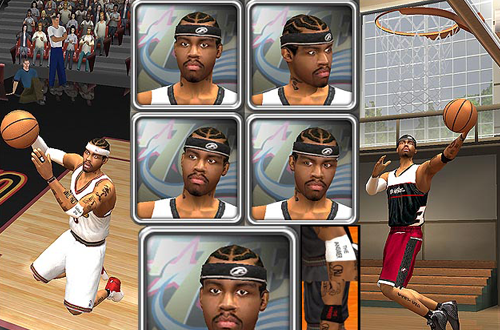 Once NBA Live made the jump to full 3D with individual player faces and more detailed textures in general, there was a lot more interest in modifying the art files. The development of tools such as the EA Graphics Editor allowed modders to extract, manipulate, and import textures, while utilities such as Blotch aided in the installation of mods. This could be a problem of course, as default files needed to be overwritten. This ran the risk of damaging files, and made it difficult and tedious to remove and reinstall mods. For gamers who weren’t particularly computer savvy, instructions beyond “take these files and put them in this folder” could be quite confusing. In NBA Live 2000 and 2001, EA Sports experimented with a special folder for modified files that the game would load instead of the originals. They expanded upon this concept with CustomArt in NBA Live 2003, and even provided us with a guide on how to use it! Originally, CustomArt needed to be enabled in a configuration file, but in NBA Live 2005 onwards, this was done by default. The process would also be simplified, no longer requiring the creation of additional art folders as in NBA Live 2003 and 2004. Some customisation functionality was lost when that happened, but we still made great use of the method right through to NBA Live 08 PC. To be frank, we’d probably been a bit spoiled by NBA Live’s use of DBF files when it came time to edit rosters in NBA 2K PC. All of a sudden, we were back to roster files that we couldn’t externally manipulate with readily available commercial or freeware programs. As I mentioned before, even though the NBA Live Toolkits had been developed to make the process of editing DBF files easier, roster editing didn’t end when they were discontinued. We had a viable alternative in DB Commander, which required a little more knowledge of the databases to use, but was more than capable of getting the job done. Unfortunately, this wasn’t the case with NBA 2K’s roster files. There have been a few roster editors for NBA 2K over the years, but none have been as comprehensive, or as instrumental to 2K modding, as Vlad’s REDitor (later RED Modding Center, or RED MC for short). Suddenly, we were able to do everything that we once could when we had DBF files to work with, going far beyond the in-game editing functionality. Later versions even included utilities to work with IFF files, making RED MC the ultimate modding tool. The process of decoding the roster files wasn’t easy, which is why new versions of the tool took a while to create. Once they were developed though, it led to the creation of some truly amazing mods. As noted above, the introduction of CustomArt in the PC versions of NBA Live was huge because it meant that textures and models could be easily replaced without being overwritten, reducing the risk of corrupting files and making it easier to remove or replace mods. Although we’ve had tools to modify the textures and models in NBA 2K games pretty much since the series came to PC, we ran into the same problem we had in the early days of NBA Live modding: files must be replaced. This meant that the cautious NBA 2K gamer had to back up their original files, keep copies of the installation for different mods, or use mod management software such as JGSME. Since the PC began receiving a port of the PlayStation 4 and Xbox One version of NBA 2K, our modding community has faced several challenges in making some of the updates that we’re accustomed to seeing. However, thanks to Limnono’s External File Plugin for NBA 2K16 and NBA 2K17, the aforementioned issue of needing to overwrite files is – for the most part – no longer a problem. It’s essentially added CustomArt-like functionality to the past couple of NBA 2K games, making it far easier for gamers to install mods. Hopefully future games can offer that functionality by default, but in the meantime, it’s been a huge development for NBA 2K modding. Big developments in modding, the major milestones that mark new chapters in the history of our community, are great examples of how far we’ve come. Every so often there will be an obstacle that forces us to take a step backwards, but when that happens, hopefully we’ll continue to rise to the challenge of creating the necessary tools, and in turn, more great mods. Which modding developments stand out the most to you? Have your say in the comments section below, as well as take the discussion over to the NLSC Forum. That’s all for this week, so thanks for checking in, have a great weekend, and please join me again next Friday for another Five.